Ouzo Bazooka was formed in Tel Aviv, a city with it’s own unique lifestyle, where one can feel that the vibrant urban scene is driven by cultural coexistence and vigorous creation. Drawing influences from this melting pot and exotic Middle Eastern feel, along with classic hard rock, psychedelic art, garage rock and surf – Ouzo Bazooka’s sound is a dizzying concoction of east meets west. Leading the pack is renowned musician and local guitar hero, Uri Brauner Kinrot, who grew up on the sunny shores of the mediterranean sea, absorbing surf culture and playing a mean rock guitar. Uri has been active in the music scene for over a decade, throughout which he has played with, recorded for, and helped shape the influential sounds of big names such as Balkan Beat Box,Shantel, Firewater and Kocani Orkestar. 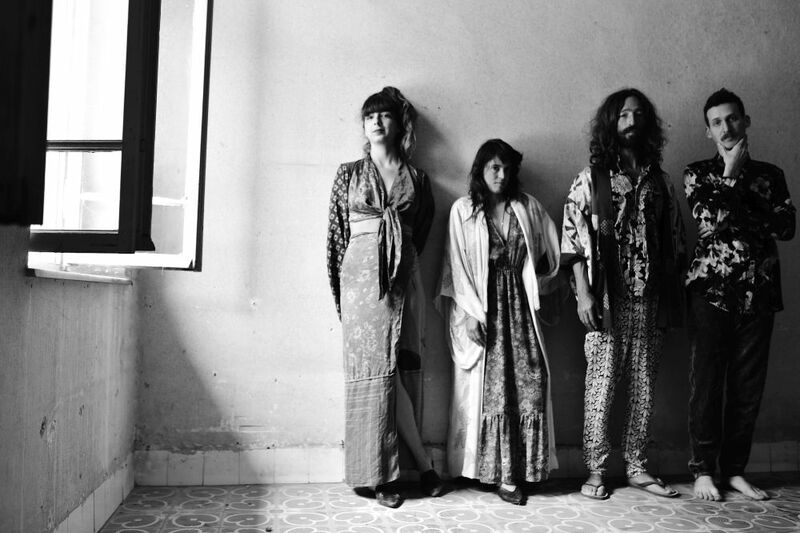 Uri is also the leader of the critically acclaimed mediterranean surf band Boom Pam, who are currently collaborating with Turkish psychedelic-folk legend Selda Bağcan. His unique sounds have made their way to far corners of the world, rocking out major music festivals such as Roskilde, Glastonbury, Fuji Rock, Lollapalooza and many more. Recorded with local giants such as Adam Scheflan on bass and Kutiman on drums, the album consists of several catchy hits granting a melodic-pop feel that brings a sweet sound to the ears with a tangy middle eastern twist. The mesmorising song, Desert Love became a major hit in the band’s local scene, spreading later on to the rest of the world. Going Down was the most played song on Berlin-based radio station, Radioeins, in 2015. Ouzo Bazooka’s self-titled debut album was released in 2014 and kicked off the bands career with a brilliant start. Uri then decided to team up with drummer, Ira Raviv (Monti Fiori, Boom Pam) and keyboard player Dani Ever Hadani (Rami Fortis, Boom Pam) to form the present band and create the second album, Simoom. The album is an elegant demonstration of Uri’s ability to combine all of his influences and experiences together in the smoothest way possible. The album takes you on a dreamy psychedelic journey through heavy fuzzed guitars, colourful synthesisers, roaring drums and “garage-esque” fun. This well-performed blend can easily be heard throughout the album, from the spacey psychedelic keys and vocals on Look Around, to the traditional heavy dabke groove ofClouds of Sorrow, and up until the swinging thundering drums on Black Witch.